To Iris on the "Ships starting with I" page. Another picture is available on this external page (click in the thumbnail to make it larger). Tonnage: 1177 gt, 663 net, 1020 tdwt. Delivered in May-1901 from Gourlay Brothers & Co., Dundee, Scotland (198) as liner Ingerid to Naaml. Vennootschap Maats Noorwegen (D. Burger & Zoon), Rotterdam. Steel hull, 236.4' x 23.2' (32.2?) x 15.5', 1213 gt, 1020 tdwt, Tripple Expansion (Gourlay Bros.) 1110ihk, 13 knots. Used as liner Rotterdam-Stavanger-Haugesund-Bergen with passengers and cargo. Line (including ships) sold on Apr. 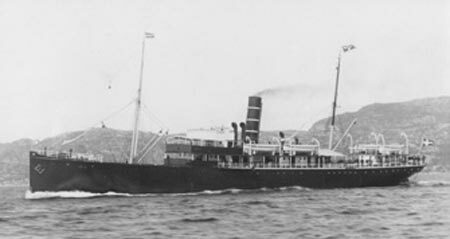 2-1907 to Det Bergenske Dampskibsselskab, Bergen, renamed Iris. The other ships were Lerfos (became Ceres) and Olav Kyrre (Flora). Ran aground near Hårr, Jæren on Apr. 22-1907, salvaged and repaired. New interior for 3rd class in 1931, interior for 1st class altered in 1938. In service to Rotterdam. A Guestbook message from the son of the Canadian Radio Operator Annie Martlieu (see crew list below). He also posted a note in May-2002, and here's a more recent message. Dispersed 53 43N 23 30W, July 25. Crew trouble, to lay up at Toronto. July 9 Cape Cod Bay Halifax July 11 BX 28 To Sydney, C.B. Towing another vessel (Panamanian Halma). Towing one ship (Halma), put back. Dec. 29 New York City Halifax Jan. 2-1943 HX 221 For St. John's, N.F. 1943 Jan. 8 Halifax St. John's, N.F. Jan. 11 HX 222 Halifax to St. John's. N.F. Jan. 22 Halifax Boston Jan. 24 HF 31 Onward to Boston. Febr. 3 New York City Halifax Febr. 7 SC 119 For St John's, N.F. Febr. 23 Halifax Boston Febr. 25 HF 38 Onward to Boston. July 21 Halifax Cape Cod Canal* July 22 XB 117 *Boston. On Jan. 9-1940, Iris rescued 2 men from a raft of the Norwegian Manx in the North Sea, 13 died (follow the link for details). Later that month, she picked up 8 (9?) survivors from the Danish Tekla, which had been torpedoed and sunk by U-22 on Jan. 21-1940 - the external website that I've linked to further down on this page has more on this attack. They were landed in Bergen, Iris' destination at the time. According to A. Hague, she sailed in the U.K.-Norway Convoy ON 14 in Febr.-1940. With mail and passengers, she's now listed in the original Advance Sailing Telegram for Convoy HN 15 back to the U.K. on Febr. 28, and early in March, A. Hague has included her in Convoy ON 18 to Norway. Later that month, she can be found in the Advance Sailing Telegram for Convoy HN 19, bound for North Shields with passengers and fresh fish. A. Hague later has her in Convoy ON 22 back to Norway, and on Apr. 3, we find her in the original document for Convoy HN 24 to the U.K., again with a cargo of fresh fish. She arrived Shields on Apr. 9; in other words, she got out of Norway just before the German invasion (Apr. 9). Her subsequent voyages are shown on Page 1. (Other HN and ON convoys also have a ship by this name, but unless the Advance Sailing Telegram is available, which usually gives the ship's tonnage, it's difficult to determine the nationality for sure. See, for instance, Convoy HN 6, where there's a Swedish Iris listed). Together with Lyra, Iris is said to have arrived Toronto on Aug. 3-1940, carrying men from the Norwegian Air Force (note that the archive document mentioned above says she arrived Montreal on Aug. 2, proceeding to Toronto on Aug. 26, arrival date is not given). According to the book "Krigens Dagbok Norge 1940-1945" they had departed Glasgow on July 21 (Convoy OB 187 - see external link in the Voyage Record; several Norwegian ships are named). The Air Force was establishing a training camp in Canada. Going back to the archive document, we see that she appears to have spent a long time in Canada; departure Montreal is given as Nov. 16-1941. A. Hague states there had been some crew trouble on arrival, adding that she was to lay up in Toronto. Skipping now to Oct.-1942, when she's listed in the westbound North Atlantic Convoy ON 137, which had originated in Liverpool on Oct. 9, but Iris joined from Halifax and arrived New York on Oct. 28, remaining there for a long time - again, see Page 1. This convoy will be added to an individual page in my Convoys section, but for now, the ships sailing in it are named in the section listing ships in all ON convoys. There's also a ship by this name listed in station 11 of Convoy HX 221 at the end of Dec.-1942; no nationality or tonnage is given, but the departure date of this convoy, Dec. 29, fits with the information found on the archive document. The Commodore for this convoy was in Abraham Lincoln, see also the Commodore's narrative, where Iris is mentioned under Jan. 1-1943, saying she was short on bunkers and was detached to Halifax that afternoon, with arrival the next day. She was bound for St. John's, N.F., and according to A. Hague, she later joined Convoy HX 222 from Halifax to proceed to that destination (Vestfold was sunk). It'll be noticed, when following the link to my page about this convoy, that she's not mentioned in the Halifax portion there, but again, this fits with the info found on the archive document, which says she arrived St. John's on Jan. 11, having left Halifax on the 8th. The following month, A. Hague has included her in Convoy SC 119, which left New York on Febr. 3 and arrived Liverpool Febr. 22 (convoy will be added, see ships in all SC convoys). Iris, however, was only bound for St. John's again, where she arrived (via Halifax) on Febr. 11 - her voyages in this period are shown on Page 2. She's also listed in Convoy HX 229A from New York on March 9. Iris arrived Halifax on the 13th, so again did not follow the convoy to the U.K. In June-1944, A. Hague has named her in Convoy HX 296, which originated in New York June 19 and arrived Liverpool July 3 (she's not mentioned in the original convoy documents). Her voyage is given as Boston to St. John's only. From Page 3, we learn that she left Boston on June 20 and arrived St. John's on the 24th, continuing to Halifax on the 26th, then returned to Boston. Little Norway - See also this page, as well as this page about Camp Norway. In the afternoon of Oct. 4-1944, Iris was approaching Cape Harrison on the coast of Labrador with supplies and personnel for the American weather station there when she ran aground in heavy weather. She had been on a voyage to various ports along the northeast coast of Canada for the American Army, the voyage having started in St. John's on Aug. 16 (Page 3). She had departed Hebron for Cape Harrison on Oct. 3. The grounding caused her to spring a leak which resulted in the engine room filling with water and by 22:00 that evening the water was 3' above the main deck. All the cabins were also flooded, but as the water at that time stopped rising it was decided to remain on board until the next morning at which time USCG Laurel came to the scene and Iris was abandoned. She could not be saved and was declared a total loss. All 36 crew + 47 passengers survived. Hearings were held in New York on Oct. 16-1944 with the captain, the 1st mate, the 2nd mate, the 1st engineer, the 3rd engineer, and the helmsman, Able Seaman Gjerde appearing. * 1st Mate Knudsen had previously survived the sinking of Scebeli. He later joined Carl Oftedal (this external page has his story - text in Norwegian). ** Annie Martlieu later joined Gudvor. Here's a message from her son, who also posted a note in May-2002, and here's a more recent message. She died in Nov.-1997. There was also a German D/S Iris, 3323 gt, ex Norwegian Herøy, sunk by allied aircraft in Aspevåg near Ålesund, Norway on March 17-1945. The Norwegian D/S Log was lost in the same attack. Back to Iris on the "Ships starting with I" page. The text on this page was compiled with the help of: "Bergenske, byen og selskapet", by Dag Bakka Jr., some info received from T. Eriksen, Norway (misc. sources), "Nortraships flåte", J. R. Hegland, "Sjøforklaringer fra 2. verdenskrig", Norwegian Maritime Museum, Volume I, and misc. (ref. My sources).